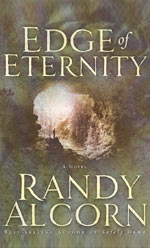 Edge of Eternity is without a doubt the most incredible fiction book I've ever read. It changed my life. I've read it over a dozen times, given another dozen copies as gifts, and ran a book study group comparing it to what the Bible actually says. Every time I read it, I find more and more details that send me researching and thinking and pondering. I'm sure a good portion of them were unintentional, but that just tells me the words were God-inspired. It's a beautiful allegory, thank you for writing it. — A.T. I am so impressed every time I read your book Edge of Eternity. It's a boost in my spiritual life and my heart longs for that place where we one day will be. The beautiful poetic words you use when creatures sing the glory of the Woodsman are an inspiration to praise our King in new ways. — G.D. In my past I have made a few mistakes and have received a couple books, through your Prison Ministry that really touched me, especially Edge of Eternity. Now getting the chance to come home, I am trying to live for God and walk the red road, instead of going in the wrong direction. I know God has a good purpose for me and it took awhile for me to accept and to want to do His will, but He finally got me to open my eyes. —R.D. I just read your book, Edge of Eternity for the second time. I don't know that I have ever read anything with such profound insight. Though I have always known that God uses all things for His good, I have always been troubled by the existence of evil. I could hear the devil telling me I wasn't good enough, and that he was unleashing the pressure of the world on my shoulders. Without that terrifying encouragement, I wouldn't have felt driven to reconnect with Our Heavenly Father and reestablish my relationship with Him. I feel that God used your writing to speak to me in the very moment that I needed it most. Though I had read it before and truly enjoyed it, in this reading, it spoke to me personally. — D.V. A few years after I had a dramatic encounter with God and turned my life over to Him, I read Edge of Eternity and thought the description of Christ's work on the cross was so powerful. Less than a year after reading the book, an old college friend was going to be in my town, and my wife and I were excited to see them and to find a natural way to share the Good News with them. We met for lunch, and they mentioned that they love to read books as they drove together. We told them about Edge of Eternity and gave them a copy as they left. About 5 months later, they came to a Luis Palau festival with us. As Luis gave people a chance to respond, my wife asked her friend what she thought about Luis' message and his invitation. She said she and her husband had already done this! She said that as they drove and read Edge of Eternity, they were impacted by the story, and prayed to receive Jesus Christ with the prayer at the end of the book while driving down I-5! Now, 14 years later, they continue to walk with Jesus. — D. T.
I first read your book Edge of Eternity four years ago. I have a son in prison. He was brought up in church, reading and memorizing scripture, but he had written saying that he'd been enlightened by some of his buddies in there, "There is no God, there is no enemy – just me and bad choices." I am not amazed that the enemy uses all kinds of disguises. In prayer I was led back to your book. On an intuition I sent my son a copy of your book. Although it is fiction I want you to know that for him it was so thought provoking he now shuns those "friends" he used to have and is now attending church and bible study again. I’m so thankful it has brought my son back to his relationship with God! — M. F.
I just finished reading Edge of Eternity for the 12th time. I have read it with new eyes, as my daughter and son-in-law have walked away from the Lord and their faith. I am always amazed at how scripture and other books, like yours, speak to me. There is SO much about falling away in God's Word, and your books have always brought me closer to examining my own walk with Christ, the glorious future awaiting all who truly seek and follow the Truth, and the perils for those who refuse. — N. S.
I just finished Edge of Eternity this morning, and I simply don't have the words to express how it has changed me. I have been in the midst of a storm for over a year and have previously made the decision to press on and reach for the Lord. Your book has given me a new perspective on running the race. I am revived, encouraged and equipped to stay on the red road to Charis and the audience of One. — A. H.
Edge of Eternity is by far my favorite book you have written! I have shared it with many friends and family... believers and unbelievers... and it has opened the door to many wonderful conversations! I am so thankful that the Lord has blessed you with the gift of writing and insight. — A. L.
Just recently read your book Edge of Eternity. Never have I thought about the Christian life like you have described it. Your word pictures of the Chasmwalker brought me to brokenness about my selfishness. All I can say is thank you. You have definitely changed my viewpoint in many areas. — E. C.
I purchased Edge of Eternity for my Kindle. I really do not know what to say. Your book touched something in me and I have not stopped thinking about it. I saw myself when Nick let Gabriel falsely lead him to think himself as the leader, special, deserving of what would have been a great sin. I have been given great gifts but I have misused them. I have sinned against our Lord and King because of my arrogance and self-will. Praise Jesus for His mercy, love, and forgiveness. Thank you for this book. — A. K.
I enjoy reading Randy Alcorn books, so started reading this one from a familiar viewpoint. Immediately this book takes you beyond familiar and places you in a new world view. While being fiction, it does challenge us to think outside the box which I like. Truth is, we are made for eternity...the question is, where will you spend it? Don’t get caught on the wrong side of this question. Your choice will have eternal consequences. I enjoyed reading this book. — J. E.
Thank you for writing Edge of Eternity. What a great adventure it was. I’m in college and must tell you that school takes away a person’s drive to read personally. Your story, a parable as it were for the Christian life, brought me a fun and emotional experience at a time when it’s easy to let life become stressful. Once again I appreciate your work knowing you enjoy doing it as much as your audience enjoys experiencing the stories. I hope to make time for another soon. — M. E.
I wanted to thank you for the only book of yours I have read Edge of Eternity. I finished it for the 7th time last night. This book has helped me view a bigger picture through very dark times I have already gone through. Things I believe no one should be tested with, things no one should ever see. I will read this book for the rest of my life, I am glad it found me. Thank you. — G. D.
I just finished the last page of Edge of Eternity, which I found for 25 cents in a public library in the used book sale room. Though 55 years old and a Christian for almost 30 years, I am touched and challenged and healed by your book. Areas of unsettledness and failure, I hope and believe, are potentially past. The small opportunities to pray for someone, or give or reach out, will be stones I can stop and pick up, as gifts to my King, without distraction and self-doubt. And my struggle to serve the Lord in significant ways feels like its over, with a new contentment to just walk the red road, doing each day’s deeds in contentment and freedom and joy. And the goal—not my spiritual development, not maximum effectiveness and pursuit of my potential in Christ—is faithfully walking the path He lays out for me, with love and gratitude and joy. — R. C.
I was born and raised in the Buddhist religion but when I was eight I did pick up a Bible and converted to Christianity. Four years later I converted my mother. When I finished Deadline, I was so overwhelmed because having a special needs child, I could relate to little Finn, along with many other aspects of the story. Being a kidney donor for my brother, the entire theme of the book was impressive. But, now that I have finished Edge of Eternity, I have been so renewed in my faith that I just had to respond with an email. Other writings have served my spirit well in building my faith, but this one in particular has allowed me to view Christ’s suffering at Calvary in a whole new respect as if it was possible. It is remarkable that I have had your book for over a month and have not chosen to read it until now. What a glorious God we serve, that he even designates the time and material of our reading with Good Friday and Easter quickly approaching. Thank you for Edge and the spiritual renewing it has brought me. I am now sending it to a friend. — A. B.
It’s four o’clock in the morning and I have just finished reading your novel, Edge of Eternity. I must confess to you that when I started reading the book, I thought it was going to be just another strange book loosely written about the end time, or something. Little did I know that your book would take me on a journey through my own life and show me myself in so many different ways. I found myself in many, many of the characters in your book. Unfortunately, some of them were not the type of person I want to think of myself as. Your book has given me a wonderful picture of the walk we each must take on our journey to the King. It has helped me put many of my wrong ideas into proper perspective. It has helped me see my journey more clearly than I ever have before. I am 45 years old, the father of five children and the grandfather of one. I have known all along that my walk with the Lord is a living example to my family. But now I can see more clearly the consequences of not staying on the road the Lord has given us to travel. Thank you again for writing this book. — D. F.
Learn more about and purchase Edge of Eternity.